Stephanie Rose Bongiovi was born born on May 31, 1993. Her parents are Jon Bon Jovi and Dorothea Hurley. 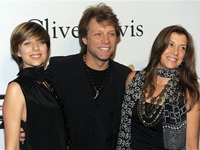 Jon Bon Jovi and Dorothea Hurley were married on April 29, 1989 at Graceland Chapel in Las Vegas, Nevada. They’ve been together since they were high school sweethearts at Sayreville War Memorial High School in Parlin, New Jersey. The couple has four children: Stephanie, Jesse, Jacob and Romeo. Boy does Stephanie look like her Mom!!! She does have her Daddy’s Eyes, Nose, and Mouth!!!! she’s equal jon!!!!!! !i love all! Oops! Thanks for the correction on her birthday! What a awesome looking family- you all rock!! Keep the faith! A great love story! !